When it comes to convincing you to get to Domu for weekend brunch ASAP, I’ve got one word for you: boba-mosa (more on those later). And if that hasn’t quite piqued your interest, consider visiting for the top-notch ramen (the hype is deserved), the amazingly friendly and helpful service, the cocktail and “liquid brunch” lineup, special brunch offerings, and the fun playlist, which unite to craft the hip and upbeat atmosphere. Served Saturdays and Sundays from 11am-2:30pm, brunch at Domu is your chance to indulge in the dinner menu without the crazy wait typical of the evening hours. After hearing about Domu’s brunch offerings, specifically the irresistible boba-mosas, I made it a priority to finally dine at this much-loved Orlando restaurant, which surpassed all of my expectations. Naturally, I kicked off my meal with a mango boba-mimosa ($5) while my brunch companion, Arlene, tried the Bee’s Knees cocktail. If you’ve ever had bubble tea, you’re likely familiar with the small, edible tapioca balls found at the bottom of the drink. Now imagine putting those flavor bursting “bubbles” into champagne instead and voila! Boba-mosa. I tried both the mango and strawberry, ultimately mixing some of the leftover bobas together. I loved the texture and flavor burst and while both were fizzy and delicious, the mango was a clear favorite. There are 8 different liquid brunch items to choose from, including a Manmosa, Sake Sangria, and a Sriracha Bloody Mary. After sipping drinks, we decided to share an order of the Benedict Bao ($9), the only exclusive brunch item on the menu aside from the liquid brunch offerings. 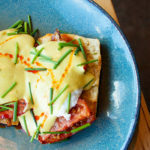 This dish combines bao with a standby brunch favorite: the classic eggs benedict. Two bao come stuffed with chashu ends, sous vide poached eggs and chives, and topped with a creamy scallion garlic hollandaise. Breakfast potatoes on the side round out this shareable plate, which works as a fun starter before moving onto the main event: the ramen! As someone whose familiarity with ramen starts and stops with the microwavable variety, I was excited and also slightly intimidated about visiting an actual ramen restaurant (and Florida’s top ramen destination according to USA Today, no less). As it turned out, I needn’t have worried at all. After admitting I was a total newbie to the world of ramen, our server happily walked me through the menu. I was thankful for her recommendations on additions to each ramen bowl and what to try as a first-timer. I went with the Tokyo ($13), a light and filling bowl comprised of chicken broth, fried chicken thigh, ajitama (a seasoned soft-boiled egg), Kikurage mushrooms, seared garlic chives, infused duck fat, and garlic scallion confit. I added in Japanese Beech mushrooms for an extra $2. From the rich broth to the hearty mushrooms and perfectly cooked chicken, this ramen totally knocked my socks off. I’m happy to report the leftovers reheated wonderfully for dinner, too. From the amazing atmosphere and service to the high-quality fare, Domu totally won me over. If you’re looking for a new brunch go-to that’s out of the norm, you won’t be disappointed. Brunch is served from 11am-2:30pm on Saturdays and Sundays. Reservations aren’t accepted for brunch. Large parties will likely be split up between tables due to the restaurant’s size. Parking is available in the parking lot and you shouldn’t have trouble finding a space if arriving early. View the brunch menu here. For more brunch info, read our guide to the Best Restaurants for Brunch in Orlando and check out the rest of our Brunch Buzz series.